Mühlbach am Hochkönig is a village in the Pongau area of Salzburg. 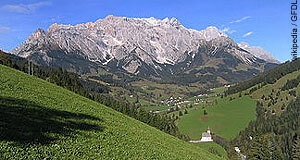 It is a famous skiing town and situated at the Hochkönig mountain, which is known for its glacier. Mühlbach itself currently has a population of approximately 1,550. We say "currently" because it used to be a great deal more until copper ore mining ceased as late as 1976 (more on this later). Mühlbach′s economy is driven mainly by tourism, particularly skiing. There are some 2,300 beds available - officially that is, in fact most hotels downplay the numbers of beds they have as much as possible for tax reasons. Mühlbach′s ski lifts are part of the skiing area Hochkönigs Winterreich, which in turn is part of the Ski Amade. The latter is the biggest skiing area of Austria and supposedly one of the biggest in Europe. However, even Hochkönigs Winterreich itself is rather impressive when you look at the facts and figures: 150 kilometres of slopes, 35 ski lifts, 35 kilometres of managed winter hiking paths, two tobogganing routes and two skiing schools. During the summer season, Mühlbach offers some 140 kilometres of managed hiking paths, 15 mountain cabins (Almen), which are managed in a combination between agricultural facility and inn, a public pool and all sorts of facilities for Alpine summer sports. Needless to say, without tourism, Mühlbach′s financial confidence would be in pretty bad shape. This was not always the case. 4000 years ago, Illyrian miners maintained a highly successful mining business in Mitterberg near modern Mühlbach. Famous jewellery and artwork such as the sky disc of Nebra were made of copper from Mitterberg ore. It is unclear why the Illyrians stopped their mining, but after they did, newly immigrating peoples (Romans, Slavonic tribes, Bavarians) did not learn about the rich copper ore deposits under Mühlbach. The area around the Hochkönig was characterised by forestry and agriculture. Only in 1828, when Salzburg had lost its independence and had become a part of Habsburg Austria, a local farmer discovered a piece of copper ore and mistook it for gold. When he tried to melt it, he set fire to his house; the incident became known to the authorities and geologists were sent into Mühlbach. They re-discovered the ancient mines and a new era of copper mining began. In 1907, at the peak of a rapid economic development, Arthur Krupp and the Viennese bank Creditanstalt modernised the mining of Mühlbach with a new company, the Mitterberger Kupfer AG. Krupp had a base building erected which is still in place and endowed the construction of two electric power plants. Mühlbach became an important industrial centre in the region with more than 3,000 residents - until the Great Depression resulted in the bankruptcy of the company in 1931. After the Anschluss, the Nazis started the mining once again in 1938; it continued until the next severe depression in the 1970ies. Mining was finally given up in Mühlbach in 1977, when skiing tourism had already developed to some extent. If you want to learn more about the 5000 years of mining history in Mühlbach, try the local mining museum "Bergbau- und Heimatmuseum", which comes with a little show mine.